Usually if you're lucky enough to have a fridge in your garage, it means that there's a shiny new refrigerator in your kitchen, and you couldn't bring yourself to trashing the old one. But Whirlpool feels every garage, workshop, or industrial space deserves a special place to keep cold beverages. So as part of the company's Gladiator line, it's created a Tonka-tough fridge called the Chillerator that looks right at home next to a wall of rolling toolboxes. 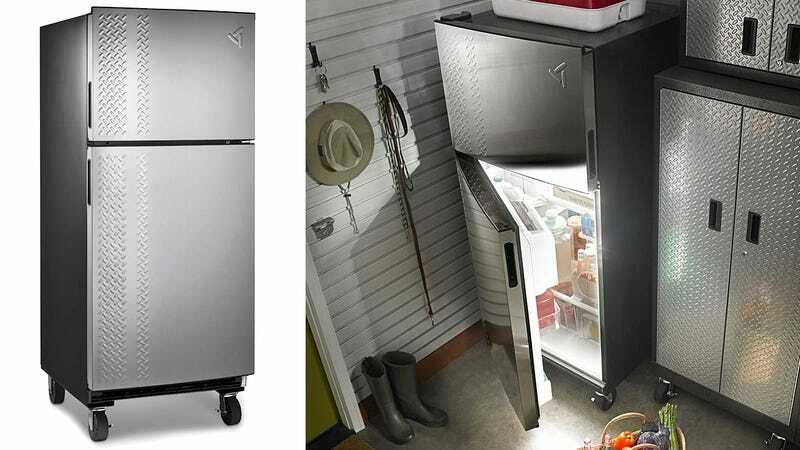 In fact, besides its stainless steel door with a diamond plate finish, what makes the Chillerator stand out from the fridge in your kitchen is that it comes mounted on a set of four oversized rubber wheels—just like a toolbox. These make moving it around a workspace a one person job. Plus, cleaning all the crap that collects behind the fridge is so easy you'd think that all refrigerators would come this way.